Few would disagree that a single family home is still, in most of the world, the gold standard for a family lifestyle, followed closely and conditioned by location, which trumps the ideal to the extent that even the most irregular site is made to work architecturally. Here is where an architect performs his/her magic. It would be great fun to see the interior of this little gold (pun intended) house which has, not only been carefully contoured to its pie shaped site, but also designed so that the low gable and shed roofs reinforce the silhouette of its hillside location. The idea of a house in a house is certainly not new. Just ask any “Carteresque” architect who has been experimenting with passive heating and cooling design since about 1976 (Top). Recently the idea has been resurrected in the form of protective screens that work to keep out both heat, as in the Indian house (middle), and cold, as in the Bolivian house (bottom). What’s new is that both of these concept houses seem to have found some universal appeal, as indicated by the fact that they are being published all over the blogisphere, and leading me to ask why? How are they different? To answer, one might first consider what else they have in common. Both plans are compact rectangular boxes, shielded on the long sides and exposed on the ends. In section it is the same, both single story boxes, with the advantage of a double functioning envelope, especially in the India house. Aesthetically these buildings are elegant in their simplicity. The message, form follows function, the former understandable and the later uncomplicated, strikes a chord with lots of people who are looking for the same things in their lives. Many think to themselves, I could do that. Maybe it is even affordable. This looks possible! Here, in the interest of moderation, boring though it may be, is a carefully thought out plan of a little house that meets some very big needs. If you click on the plan, it will enlarge so you can follow the points below. The main entry is into a foyer and circulation area, allowing for access to additional floors, if they are used, without the necessity of passing through the private part of the house, and allowing a home business or multifamily living arrangement. The living and dining areas are exposed to the outdoors on threes sides giving ample opportunity for light, additional entries & a fireplace. The galley style kitchen, including washer/dryer combination adjacent to the hallway, pantry and counter with seating, is open to the main living and dining space. There are two toilet rooms, one of them handicapped compliant, and a large handicapped accessible wet room with both tub and shower which is intended for use by all residents, pets included. There is a single wet wall serving both kitchen and bathrooms which is a cost effective way to install plumbing. 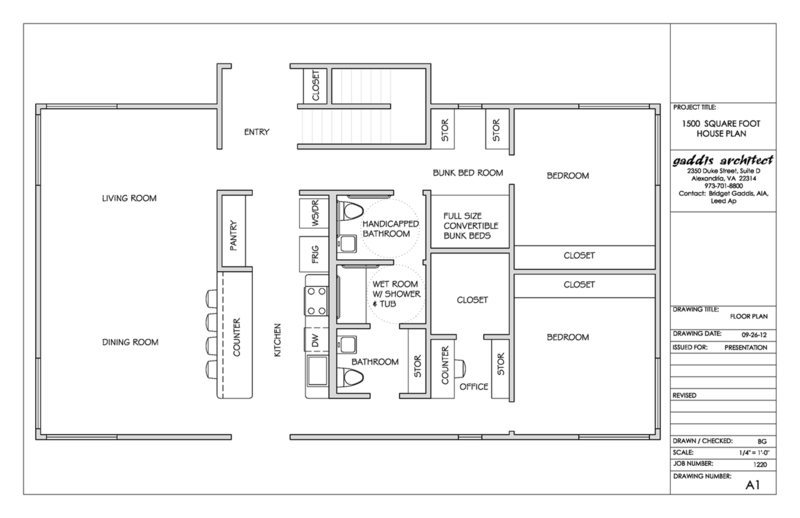 The need for an office, additional sleeping space for company and part time residents, and extra storage is address by using the transition space off of the hallways on the way to the bedrooms. There are two good sized bedrooms, on the same floor as the bathrooms, important for aging or handicapped residents. Each bedroom has a good sized closet and is exposed to the outdoors on two sides for light and air circulation. What has teeth but doesn’t chew? If I had to design a logo for the ideal middle class suburban lifestyle it would include a white picket fence. There is an entire body of lore formulated around them. They adorn small town cottages, schmaltzy valentines, fuchsia covered front porches, and bed & breakfasts abiding in the land of quaint. They connect with pergolas, gazebos and all manner of outdoor ornament. We find them enhancing everything from rabbit cages to mobile homes and no small town florist is without a picket fence theme among their best selling arrangements. There is a gift shop and a TV series named “Picket Fences,” alas movies, even the lyrics to a song reference the image. I guess it can stand up to a bit of analysis. Visually, a fence is attached to and extends the image of a house it surrounds, meaning it dilutes the view; so if a home owner, as per the top photo, wants his residence to be a focal point, as in the grand manor house at the end of a path, then he would be ill advised to enclose it, especially with a prominent and matching fence. If a fence must be used in such a scenario, make it match the landscape or better yet, disappear. On the other hand, as per the bottom photo, a fence installed around a tiny house makes it appear bigger by implying that the yard is living space, as was often the condition in post war US suburbia, and the de facto source of our continuing romantic visions. I find it interesting that readers are reluctant to publicly share their thoughts in the comments section of this blog, choosing instead to send me emails. I was told in one such note that I should make more of an effort to explain my ideas to those wanting to improve things but not artistically trained or astute enough to know how. My position has been, hire and architect. Problem solved. I have, nevertheless, taken the comment to heart and hope, going forward, to show more fully how improvements might be made, starting with the two modern houses here. Even an untrained eye can tell that the house above is not quite right. Built in 2005, the water stains under the windows, the vinyl siding, the off the shelf colonial garage door and brick wall combine in a way that makes the place look more like a homemade remodel than a fairly new modern style house. The lesson is that materials matter. By adding a bit of wood the same horizontal siding looks better on this house. Imagine the improvement had the pink bump out and garage door on the house in the photo above been wood and the wall and foundation matched the concrete stairs, not an expensive way of providing a huge fix. 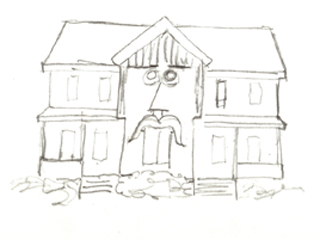 Frito Bandito House, Sorry for another bad doodle. One might want to consider the emerging imagery before too literally duplicating each side to form a duplex. That way at least the eyeballs can be exactly the same size and set far enough apart so that they are not crossed. Also the addition of a nose would make the house easy to find, allowing residents to tell their friends that they live in the “Frito Bandito House.” Gotta love those micro managers! This circa 1966 Gelleresque vision is so bad it’s good. In case you are not a history buff, Andrew Geller was an architect and real working icon of the mid century “age of optimism,” characterized by capitalization, industrialization, and modernization. The “Windows of the World” complex on top of the World Trade Center was among the many projects he designed, including numerous summer houses along the East Coast. He spent much of his career looking for inexpensive ways of providing modern conveniences to lots of people; and he seems to have succeeded because it wasn’t long before cheap A-frames, like the one in the photo, were popping up all over the country. These were actually considered a little ugly at the time, and probably still are. It is the overwhelming effect of my architectural nemesis, the point, that causes the problem. Redemption comes along, though, in the complex and interesting interior space created by the A-frame structure. It appears in the kitchen above and in an original Geller sketch below. It soon becomes clear how one might both love and hate these little houses. For myself, the most beautiful house I have ever entered was actually an A-frame, which is a story for another post.